Located on a small hill in Lia, Villa Amanda enjoys panoramic views, wind protection and proximity to the beach. What else could you ask for? 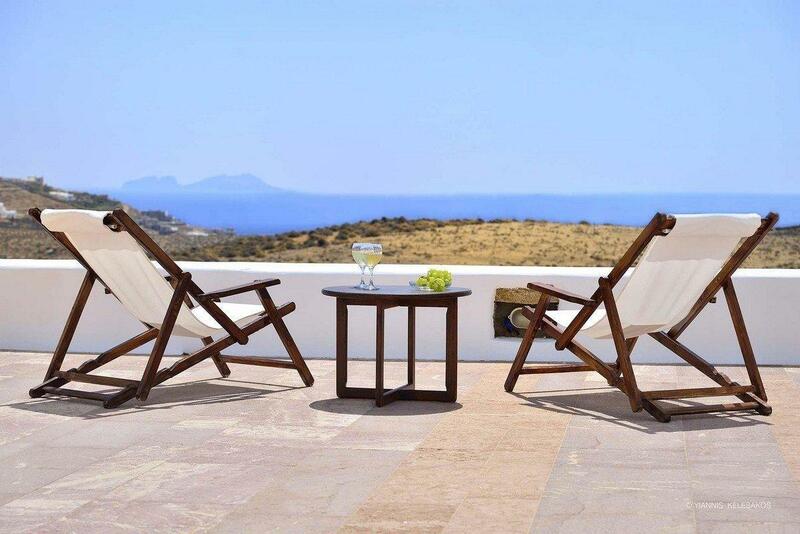 The luxury Mykonos villa is perfect for relaxing holidays. The buzz of the town is 10.9 km away and the beach only 950 m. The only hard choice you’ll have to make is where you’ll get your suntan! By the beach or by your private pool? You need a group of 10, family or friends, and the rest is on us! The villa is divided in the main house and two apartment suites. Plenty of space, huh?Traditional Cycladic design and white and blue elements blend perfectly for the ideal relaxing environment. 5 spacious bedrooms with en-suite bathrooms, living rooms, kitchens and dining rooms are only half of the surprise that is waiting for you. The other half of the surprise is the private roof terrace. The large private infinity pool will be your favorite spot. Grab your camera and enjoy selfies in the amazing view. The BBQ offers the chance for yummy sunset dinners under the pergola. Our chef will amaze you! Book him in advance and you will beg for more BBQ nights!